It provides traffic information to your work or home, knows those scores of sports teams you follow, has the weather forecast for your location and can even tell you who Kevin Spacey is. It can interpret a lot of things from your search history as well. If you've been searching for, say, your favorite football team, Google Now will prepare a card showing you the next match the team is playing and will provide you score updates once the game begins. If you allow it, can scan your email for upcoming flights, deliveries or restaurant reservations and let you know when they are due. There are also numerous kinds of cards like birthdays (yours and contacts') and what distance you've walked in a particular month. The last one could definitely feel creepy for some users, but it's easily turned off from the Google Now settings menu. Making dictation available offline also made it faster. What's even more impressive is that the transition hasn't cost anything in terms of accuracy. The 2013 Asus Nexus 7 is powered by Qualcomm APQ8064 Snapdragon S4 Pro SoC, which packs a 1.5 GHz quad-core Krait CPU and Adreno 320GPU. There's 2GB of RAM on board to keep things running smoothly at all times. The slate's chipset recorded a respectable outing in the synthetic benchmark field. Despite not being the latest and greatest available on the market today, it often rubbed shoulders with the established top dogs in the smartphone field- both in terms of CPU and GPU performance. As far as tablets go, most of the time, the new Nexus 7 handily posted better benchmarks scores than its competitors in and around its price range. See for yourself below. GLBenchmark 2.x puts the graphics processor to the test. Epic Citadel, on the other hand, measures performance at native resolution. 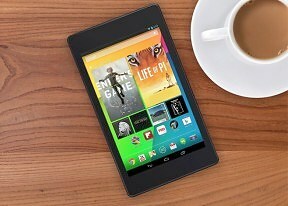 Benchmarks aside, there wasn't a task, which the 2013 Asus Nexus 7 couldn't handle with ease. We did for example, spend quite a few hours playing Real Racing 3 (ah, the joys of being a reviewer!) - one of the most graphic intensive games available out there. The tablet performed buttery smooth, without even a hint of lag.